A co-signer is someone who agrees to sign a lease agreement with you. By signing the agreement, he or she is agreeing to be responsible for any debts you owe to the landlord if you do not pay your rent or break the lease agreement in any other way. A co-signer will be named on the lease along with the actual tenant even though they are not physically living in the property. Most landlords have a tenant screening process, which may include a credit check and/or a background check to see if tenants meet certain qualifying standards. The following types of tenants may have a difficult time being approved to rent an apartment without a co-signer. Low-Income- Landlords want to rent to tenants who can afford the apartment. Many landlords will require a tenant to make at least two and a half times the monthly rent to be considered for the rental. For example, if the rent is $1,000 a month, the tenant must make at least $2,500 a month. Tenants who did not meet this criteria will likely need a co-signer to qualify for the rental. Poor Credit- Below 620 is often considered a low credit score, while above 700 is considered excellent. Landlords want to rent to tenants with good credit. Landlords may require tenants with bad credit to have a co-signer to feel comfortable renting to them. No Credit- Having no credit history is also a red flag for landlords. You have no history of responsibly paying your debts, so landlords will often require a co-signer to minimize their risk. No Rental History- Many landlords will feel more comfortable renting to a first-time tenant, such as a college student if a co-signer also signs the lease to vouch for the tenant. Tenants With a History of Eviction- Tenants who have been evicted in the past for non-payment or other lease breaches are not the most desirable. To even consider renting to a tenant with an eviction history, most landlords will require a responsible co-signer to also sign the lease. Co-signing a lease or other loan is a huge risk. Think about the following before you agree to it. Interview- Co-signing a lease is business. You must put aside your personal relationship and analyze the individual’s finances and ethics. Have they gotten into financial trouble in the past? Do they have a hard time holding a job? How much do they make? How much debt do they have? Look at Your Own Financial Situation- Can you actually afford to co-sign a lease? Even if you have good credit, do you have the cash on hand to pay for missed rent payments or to cover larger debts like damages owed and court costs? You Will Be Responsible for Unpaid Rent- If the tenant does not pay their rent, you will be responsible for paying this rent, immediately. You Will Be Responsible for Any Other Debt- In addition to rent, you will be responsible for any other financial debt the tenant owes to the landlord. This includes damage to the apartment that exceeds the amount of the security deposit. Nonpayment Will Affect Your Credit- If the tenant gets evicted for any reason, it will negatively affect your credit because your name is also on the lease. Run Same Screening Procedures on Co-Signer- Don’t assume that anyone agreeing to co-sign a lease is financially responsible. You need to run a credit check on them as well and get proof of income and employment history. Don’t Have to Rent to a Tenant With a Co-Signer- While a co-signer can make a prospective tenant more desirable, you are not obligated to rent to a tenant because they have a co-signer. If you feel another prospective tenant is more qualified, it is your right as a landlord to rent to them instead. Ask Close Family or Friends- Co-signing a loan is a very personal decision. Your best chance of hearing a yes is to ask someone who knows you well. People who have a long history with you, such as your parents, siblings, cousins or family friends may feel more comfortable as they have seen your character over time. Explain Your Situation- Explain to the individual why you need a co-signer. Are you fresh out of college with no credit history? Did you make a poor financial decision when you were very young that stayed on your credit report? Be honest because a co-signer is taking on a lot of risk. 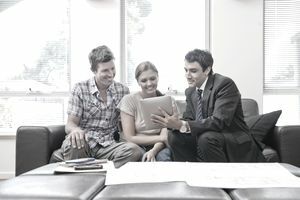 Prove You Are Trustworthy- Give examples of why the co-signer should be comfortable signing a lease with you. If you are fresh out of college, cite your college G.P.A. Have you held a steady job over time? Do you have a good income and low debt? Offer to Sign a Separate Agreement With the Co-Signer to Pay Back Any Debt Owed- You can offer to sign a separate binding contract with the co-signer. If for any reason they have to pay for any of your debts, you would be responsible for re-paying them two times the amount they paid off.